Isn't it the cutest!?! I just love the fresh feeling colour combination, and that you get the impact of the gorgeous DSP, but only need to have some little scraps to accomplish it. LOVE it! You can see Angela's post about this card by clicking on the picture, you can browse the rest of her site by clicking on her name above. Be sure to take a look at the photo of the cards from her black and white swap, they're stunning! 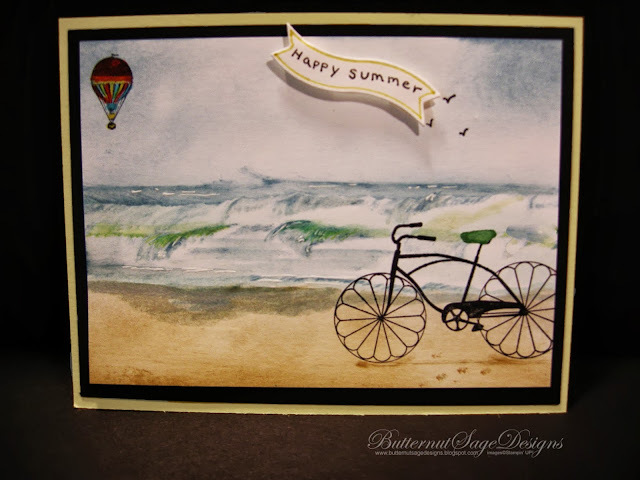 Our second stamper today is Donna from Butternut Sage Designs. The term paper crafting doesn't seem sufficient to describe this project. The artistic talent displayed here really puts this card in another category all together. Can't you just hear the surf breaking when you look at that gorgeous background? I'd love to learn how to do that, why do you live so far away, Donna? Your card has truly captured a happy summer. To see Donna's blog, click on her name above, to go directly to this post click on the picture. If you like these cards, please stop by the posts of these talented ladies and leave them a comment telling them so. Feeling inspired to create something of your own now?